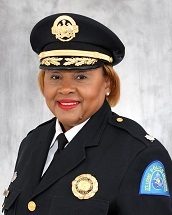 Lt. Col. Rochelle Denise Jones is a commissioned officer with the St. Louis Metropolitan Police Department, joining on May 16, 1983. After being promoted to the rank of Sergeant in July of 1991, she served in the Seventh District, Internal Affairs Division, and the Canine/Mobile Reserve Unit. Lt. Col Jones was promoted to the rank of Lieutenant in November of 2001. As such she was the first female in the Department’s history to be named and serve as the commander of the Homicide Division. She also served in the Fifth and Sixth Districts. In April of 2006, Lt. Col. Jones was promoted to the rank of Captain. She served as the Special Projects Director for the Inspector of Police and the Commander of District Eight. Once again, she was the first female (and first person to hold the newly created position) in the Department’s history to become the Patrol Executive Officer, which gave oversight to each of the three Area Stations and command of the Special Operations Division (Gang Unit, Juvenile and Narcotics Units) for these Area Stations. On January 16, 2013, Lt. Col Jones was promoted to the rank of Major and was assigned as the Night Chief and the Commander of Support Operations Division. On October 5, 2015, Lt. Col. Jones was transferred to the Bureau of Operations as the Deputy Commander. Lt. Col. Jones was selected to participate in the NOBLE (National Organization of Black Law Enforcement Executives) “Chief Executive Mentoring Program”, which is a two year block of study and instruction at Cedarville University (Ohio), with graduation July 24, 2012. The specially selected candidates aspire to become a Chief of police in the future. Lt. Col. Jones has also attended and successfully graduated from the prestigious Senior Management Institute for Police. This is a course of study in executive strategic management that is facilitated thru PERF (Police Executive Research Forum). Lt. Col. Jones is also a graduate of Leadership St. Louis thru FOCUS, which is a locally based nonprofit and is committed to creating regional solutions through community leadership. Lt. Col. Jones holds a Master of Arts degree from Webster University in Leadership and Management and a Bachelor of Arts degree from Concordia University in the Management of Criminal Justice Systems. Lt. Col. Jones is a native of Saint Louis, Missouri and is the oldest daughter of Charles (Sr.) and Janet Jones. She loves to watch live plays at the Muny Opera and the Fox Theatre, study leadership, collect and wear antique clothing and jewelry. On August 15th, 2017, Lt. Col. Jones was promoted to her current position and is the Commander of the Bureau of Professional Standards. On April 15th, 2018, Lt. Col. Jones was assigned to the Central Patrol Area Station as Deputy Chief. On January 1st, 2019, Lt. Col. Jones was assigned to the Bureau of Specialized Enforcement as the Deputy Chief and presently holds that position.